Colourful Santa Fe is a meeting point of ancient and modern America, blending the earthy spirituality of native Pueblo Indians with the picturesque landmarks of a colonial Spanish past. Often called the ‘City Different’, Santa Fe’s laid-back Southwest ambience is invigorated by the creative vibe of the many artists and filmmakers who call it home. The city has a huge arts and dining scene that far surpasses its small stature. More than 250 galleries are packed into the centre, particularly along Canyon Road, where top international artists show off their work in quaint adobe buildings. The revamped warehouses of the Railyard district offer an edgier creative world, while impressive contemporary works by Native American artists find their place too. Don’t forget your camera because fanning out from the historic central Plaza are streets filled with striking images: sand-coloured Pueblo Revival buildings that contrast sharply with the piercing blue sky, while strings of red-chillies dangle in the breeze. Elsewhere, charming old adobe homes sport brightly painted doors and window frames. Tradition is hip too - from fashion to décor. Think handmade leather boots, and fabulous silver and turquoise jewellery crafted by Pueblo artisans. Beautiful pottery, stonework, weavings and carvings are found everywhere. Even better, eating in Santa Fe is simply awesome. Its distinct cuisine is built on generations-old recipes that blend Native and Hispanic foods. Try local specialities such as green and red chilli dishes, salsas and blue corn tortillas, as well as innovative dishes from top chefs. Explore the city’s outstanding museums, browse in its boutique shops or relax in its inviting spas. At night, check out the live music in lively bars and restaurants. There’s also a busy schedule of festivals celebrating everything from chillies to wine to music as well as a world-class summer opera programme. 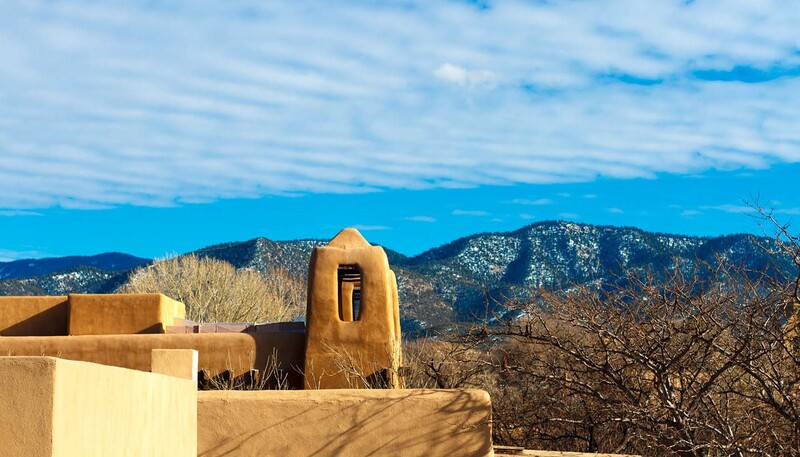 Basking in sunshine year-round and surrounded by a stunning mountain landscape, Santa Fe is a favourite American destination, and no wonder - it’s a city of timeless beauty and endless fun.